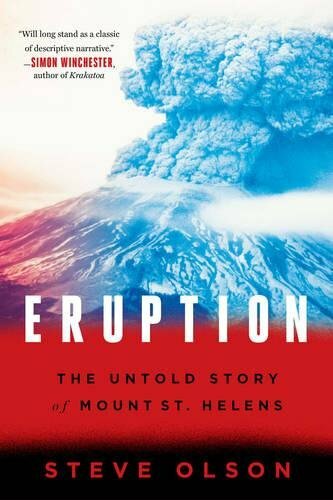 A riveting history of the Mount St. Helens eruption that will “long stand as a classic of descriptive narrative” (Simon Winchester). Shedding new light on the cataclysm, author Steve Olson interweaves the history and science behind this event with page-turning accounts of what happened to those who lived and those who died. Powerful economic and historical forces influenced the fates of those around the volcano that sunny Sunday morning, including the construction of the nation’s railroads, the harvest of a continent’s vast forests, and the protection of America’s treasured public lands. The eruption of Mount St. Helens revealed how the past is constantly present in the lives of us all. At the same time, it transformed volcanic science, the study of environmental resilience, and, ultimately, our perceptions of what it will take to survive on an increasingly dangerous planet. Rich with vivid personal stories of lumber tycoons, loggers, volcanologists, and conservationists, Eruption delivers a spellbinding narrative built from the testimonies of those closest to the disaster, and an epic tale of our fraught relationship with the natural world.